With unemployment dipping below 4% for the first time since December 2000, employers have their work cut out for them to keep workers happy. 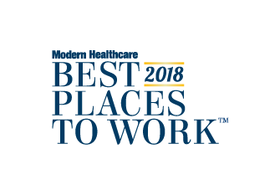 Organizations making this year's list of Best Places to Work in Healthcare stand out in their efforts to create an empowered and satisfied workforce. Below is an alphabetical list of the companies and organizations. A ranked order will be revealed at an awards dinner Sept. 27 in Dallas during Modern Healthcare's Workplace of the Future Conference. They will also be featured in a special supplement published along with the Oct. 1 issue of Modern Healthcare. and conference, contact Jodi Sniegocki at [email protected] or 312-649-5459. For advertising information, contact Ilana Klein at [email protected] or 312-649-5311. ABM Healthcare St. Clair Shores, Mich.
Accountable Healthcare Staffing Boca Raton, Fla.
American College of Cardiology Washington, D.C.
Atlantic Health System Morristown, N.J.
Bailey Medical Center Owasso, Okla.
Beach Cities Health District Redondo Beach, Calif.
Black River Memorial Hospital Black River Falls, Wis.
Bluegrass Care Navigators Lexington, Ky.
Boone County Health Center Albion, Neb. Cahaba Medical Care Centreville, Ala.
Christus Shreveport-Bossier Health System Shreveport, La. CommWell Health Newton Grove, N.C.
Computer Task Group (CTG) Buffalo, N.Y.
Conway Regional Medical Center Conway, Ark. Cox Monett Hospital Monett, Mo. CQuence Health Group Omaha, Neb. Cumberland Consulting Group Franklin, Tenn.
Deaconess - The Women's Hospital Newburgh, Ind. FreemanWhite, a Haskell Co. Charlotte, N.C.
Healthcare Resource Group Spokane Valley, Wash.
Hills & Dales General Hospital Cass City, Mich.
Hoag Orthopedic Institute Irvine, Calif.
Hospice of the Northwest Mount Vernon, Wash.
Jackson Physician Search Alpharetta, Ga.
Jamestown Regional Medical Center Jamestown, N.D.
Joliet Area Community Hospice Joliet, Ill.
King's Daughters Medical Center Brookhaven, Miss. Lafayette General Medical Doctors Lafayette, La. Lafayette General Surgical Hospital Lafayette, La. Landmark Health Huntington Beach, Calif.
Lee's Summit Medical Center Lee's Summit, Mo. Lexington Regional Health Center Lexington, Neb. Loma Linda University Surgical Hospital Redlands, Calif.
Medicus Healthcare Solutions Windham, N.H.
MedPartners Locum Tenens Coral Springs, Fla.
Memorial Healthcare System Hollywood, Fla.
Monarch Medical Technologies Charlotte, N.C.
Morrison Healthcare Sandy Springs, Ga.
National Medical Billing Services Chesterfield, Mo. Navin, Haffty & Associates Westborough, Mass. Neosho Memorial Regional Medical Center Chanute, Kan.
New England Donor Services Waltham, Mass. Pacific Companies Aliso Viejo, Calif.
Parkview Huntington Hospital Huntington, Ind. Parkview LaGrange Hospital LaGrange, Ind. Parkview Noble Hospital Kendallville, Ind. Parkview Ortho Hospital Fort Wayne, Ind. Parkview Wabash Hospital Wabash, Ind. Parkview Whitley Hospital Columbia City, Ind. Pelham Medical Center Greer, S.C.
Pivot Point Consulting, a Vaco Co. Brentwood, Tenn.
Providence Little Company of Mary Medical Center Torrance Torrance, Calif.
Royal Ambulance San Leandro, Calif.
Santa Rosa Consulting Franklin, Tenn.
Self Regional Healthcare Greenwood, S.C.
Shriners Hospitals for Children-Erie Erie, Pa.
South Baldwin Regional Medical Center Foley, Ala.
South Broward Endoscopy Cooper City, Fla.
Southern Tennessee Regional Health System-Pulaski Pulaski, Tenn.
St. Martin Hospital Lafayette, La. Stillwater Medical Center Stillwater, Okla.
Sutter Amador Hospital Jackson, Calif.
Sutter Davis Hospital Davis, Calif.
TigerConnect (formerly TigerText) Santa Monica, Calif.
TSI Healthcare Chapel Hill, N.C.
Tulsa Spine & Specialty Hospital Tulsa, Okla.
University Hospital and Clinics Lafayette, La. Weatherby Healthcare Fort Lauderdale, Fla.
Woman's Hospital Baton Rouge, La.